Chose small firm red tomatoes for this Recipe! Wash the tomatoes and cut them in two crosswise. Cut the cheese to fit in the rounds of tomatoes. Place the tomatoes in a round baking dish. Season with salt and pepper and a light sprinkling of sugar. Place the cheese in each tomato, and sprinkle with marjoram and breadcrumbs. Bake in a 250 degree oven for about an hour. Serve hot or cold. One garlic clove minced should equal about a teaspoon! Cut the bread into long thin slices and toast until golden under the broiler. Sprinkle with Parmesan and reheat briefly. To make the pesto, peel the garlic and finely chop it. Peel and finely chop the onions or scallions. Coarsely chop the mint or cilantro. Mix it all together and season with salt and pepper. Spread half the pesto on the grilled toast and place in a 300 degree oven for 5 minutes to heat through. Sprinkle with salt and serve with the remaining pesto on the side. Tapenade is an traditionally an olive mixture from Provence. Combine all the tapenade ingredients in a food processor and pulses until they reach the smoothness you prefer. (I find it’s more interesting in the mouth to have a few bigger pieces – they give the tapenade a nice bite.) Chill until needed. Hard-boil the eggs by putting them in a heavy pan, covered 1 inch by cold water and bring to a rapid boil over high heat. When boiling, turn off the heat, cover the pan, and set the timer for 14 minutes. When the time is up chill the eggs under cold running water and crack and peel. Slice them in half and arrange them cut side up on a platter or an egg dish, if you have one. 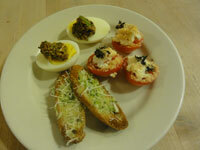 Put half a spoonful of tapenade in the center of each half egg; serve while the eggs are still warm.